Sunday Series 1, Race 2; Right to the last hour, before the start sequence, the wind didn’t seem to want to show. Very fortunately, some great guy must have heard our plea and turned on his fan and the breeze kicked in at the very right moment. The multihulls where the first to be started off, followed 5 minutes later by the keelboats. A little jostling at the start line saw three boats, Brio, Red Rum and Sangaree being caught OCS. Steve was quick to swing Red Rum back across the line to be the first to be exonerated. The generally easterly wind direction at the start made CAAS 2 the ideal windward mark. The winds continued to be in our favour, the three beach cats took advantage of it and zoomed towards Tekong. Unfortunate for Jeremy, a wrong mark rounding caused him to have to retire. 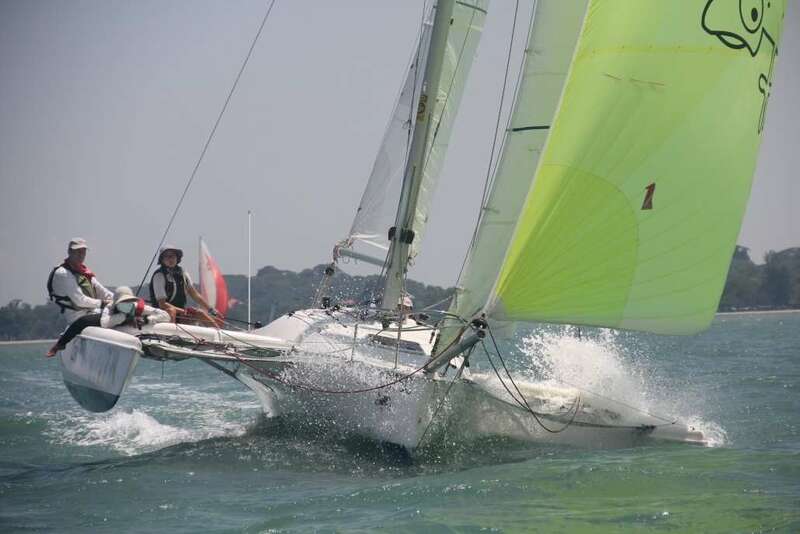 Uli Braun in Allo finished 1st and Chris Waddington came in 2nd in Persian Cat. Tim Jackson held the Weta flag flying as he did a solo run around the course. Calling all Weta owners, come keep Tim company at the next race please. Finishing only 12 seconds apart after corrected time, Tim Hill in Cicak managed to hold Graham Horn in Jaza Too for most part of the race. Unfortunate for him Graham took over the lead to secure his 1st place. Shaun finished 3rd about 11 minutes later. Steve Manning did a quick recovery from his OCS start and took line in the IR class. His lead was good enough to also come in 1st for the race. Shardana’s lead over Jong Dee also saw her maintaining her 2nd placing across the line, Jong Dee finished 3rd. And forming the biggest class, the PY division saw ten boats at the start line. Kevin in Temptress of Down had a good start and managed to hold the lead throughout the race. It was rather close sailing for the top 5 PY boats. Temptress of Down, Southern Light, Sangaree, Bapsy and Minx were only 11 minutes apart in actual sailing time. In the end, after corrected time, the 1st place went to Southern Light, 2nd place to Temptress of Down and 3rd to Bapsy. Big thank you to all sailors who have participated in the second race of the Sunday Series! We look forward to seeing you on 13th April, for the Twilight Series.